Is The English Cocker Spaniel Right For You? English Cocker Spaniels are known for their joyful and outgoing demeanor. They are easy to train, adaptable, and great with children which makes them perfect family dogs. English Cocker Spaniel puppies are best when socialized early with children to avoid any shy or dominant tendencies. The English Cocker Spaniel can track their origin back to the first spaniels brought over to England from Spain. The smaller cousin to the Springer Spaniel, the Cocker got their name because of their use in the flushing of woodcock, a popular game bird. One of the smallest sporting dogs, the English Cocker Spaniel was first recognized as their own breed by the AKC in 1946. 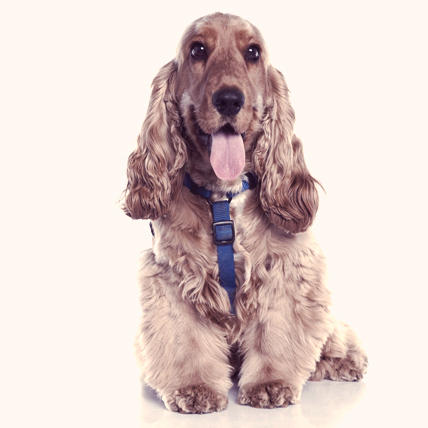 A medium sized, solid breed, the English Cocker Spaniel has droopy ears that can stretch all the way down to the end of their muzzle. Their wavy, smooth, medium length coat is short on their face and feathered on their ears, legs, and tummy. Their face is somewhat boxy from the side, and their muzzle juts out and doesn’t taper down. They have a muscular, deep chest, and have a medium length tail that is traditionally docked. A smart, loving, lively, pleasant dog, the English Cocker Spaniel is a great family dog. They get along well with children and are typically great with strangers, although they may not warm up immediately. Due to their sensitive nature, the English Cocker Spaniel require a calm, relaxed tone when being trained and socialized. The English Cocker Spaniel can be black, black and tan, black and white, white and tan, blue roan, blue roan and tan, golden, lemon roan, liver, liver and tan, liver and white, liver roan, liver roan and tan, liver white and tan, orange and white, orange roan, red, red roan, lemon and white, red and white, sable, sable and tan, and sable and white.